Deep Creek Landing is a full service marina located on the James River in Newport News, VA. Open 7 days a week all year long, our modern 80 slip venue is one of the most luxurious marinas in Hampton, VA! We offer a full service boating yard including painting, repairs, and hauling, and we also have an on-site motor repair shop. On top of our fantastic boating services, our marina is also perfect for waterfront weddings, corporate retreats, and many more events. We started this blog to help promote all of the great things about Deep Creek Landing. We’ll offer boat maintenance tips, boating news, and a variety of ways you can utilize our venue for your next event right here on the blog. We’re dedicated to providing the absolute best services to all of our customers and we want to reflect that in the content we share with our customers. Whether you need a quality place to dock your boat or are looking for the perfect wedding venue, Deep Creek Landing has everything you could possibly need, all in one stop! 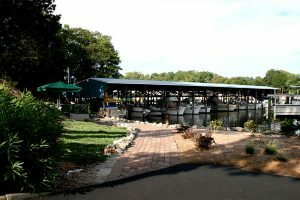 Our marina comes equipped with a large banquet room, waterfront deck, and relaxing greenery settings so you can have a small taste of paradise right here in Virginia. If you’re interested in booking your stay at Deep Creek Landing, contact us today at (757) 877-9555 or fill out the form on our website, DeepCreekLanding.com. This entry was posted in Uncategorized and tagged marinas in Hampton VA on December 26, 2016 .